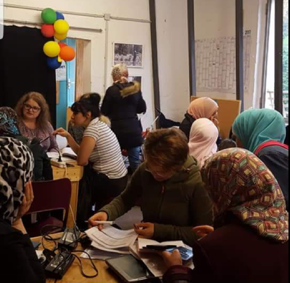 News – Women Café – THFwelcome e.V. On Sunday, we organised a computer and smartphone training – most importantly to enable everybody to check the internet-based housing market independently. Since not every woman has a smartphone or an email account, we had to deal with a lot of base work first. However, we didn’t let the mood spoil! If you are interested to support us come over and say hello. We are there on Sundays, 4-6 p.m. Or email us: info@thfwelcome.de.